Compact, versatile and built like a tank, the Sidewinder Compact II Tactical Military Flashlight from Streamlight is an essential addition to every tactical load out. Four separate LED light sources provide the versatile lighting needed to handle any situation. 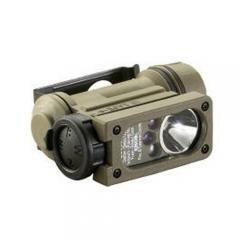 A powerful 55-lumen C4® white light for general illumination purposes, red for preserving night vision, infrared (IR) for use with night optics or night vision goggles and blue for signaling purposes. Each light source has four brightness settings as well as a strobe mode that balances the perfect amount of illumination in any environment with battery conservation. A rubber rotary selector knob and push button allow operators to easily cycle through each setting and LED color with or without gloved hands. Designed for tactical use, the light can be securely fastened to most military helmets, elastic headbands and MOLLE-compatible platforms. Powered by either a CR123A or standard AA alkaline/lithium battery, the Sidewinder ensures no one is ever left in the dark.